I hope folks had a nice Thanksgiving. I’m stuffed and can barely think about food right now. My mom likes making low centerpieces (so people can still see and talk across the table, but they’re still colorful and festive) for our Thanksgiving table. She hollows out small sugar pumpkins and puts flowers in them. They’re really cute! This year I took the seeds and roasted them. I set aside a handful to dry out and plant next spring. I may have failed at the kabochas this year, but I’m not going to let that stop me! Pumpkins ahoy! Heat oven to 325. 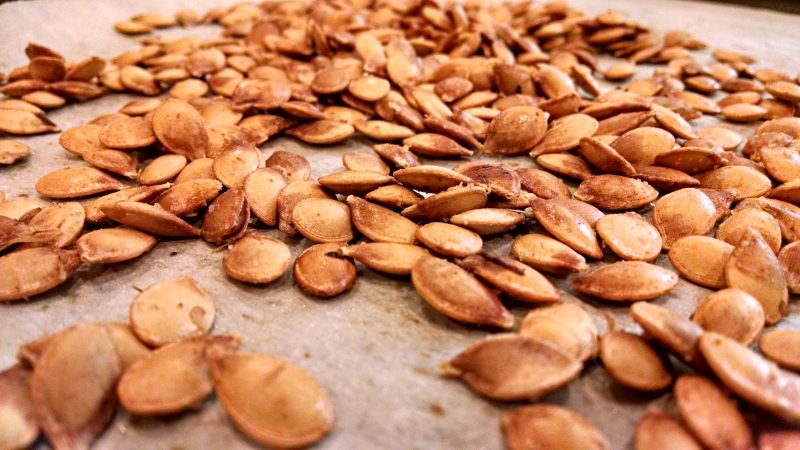 Rinse the pumpkin seeds to remove any giant pieces of pumpkin flesh left clinging to them. Don’t be too obsessed with removing every last strand—small pieces are fine (they’ll add to the flavor, maybe). Spread out and dry with paper towels. They’ll stick to the towels, just flick them off. Toss with a little olive oil and salt. Spread out in a single layer on a baking sheet lined with parchment paper. Sprinkle with a little extra salt (kosher is nice). Roast at 325 for 30 minutes, stirring every 8 minutes. Keep an eye on the doneness after 20 minutes to make sure they don’t burn. You want a nice toasty brown. Cool completely before storing (otherwise they’ll lose their crunchiness).